So far we’ve taken Shirley up to the middle of 1937. She’s been Hollywood’s top box-office star for two years, and she’ll go on to be for two years more. This is probably a good time to deal with one of Hollywood’s most persistent and tantalizing legends: Is it true that Shirley Temple was originally set to play Dorothy in The Wizard of Oz? The short answer is: No, but there may be a complicated grain of truth to the legend. In fact, given Shirley’s stature in the industry during the mid-to-late 1930s, it’s unlikely that there wouldn’t be something to it. First of all, before we go any further, dismiss from your mind any images of Shirley chirping her way through “Over the Rainbow” or pumping her fists and pouting that she wants to go home. Frankly, I suspect those are scare-images conjured up by Judy Garland’s more jealous fans, in that unique way they have of seeking to tear down anyone they see as a threat (Deanna Durbin, for example) — as if Judy needs that kind of help. If Shirley had made The Wizard of Oz, there would certainly have been no “Over the Rainbow”, and possibly no songs by Harold Arlen and E.Y. Harburg at all. The Wizard of Oz starring Shirley Temple would have been utterly and absolutely different — far more different, for example, than Gone With the Wind would have been if Paulette Goddard had played Scarlett rather than Vivien Leigh. Granted, it’s hard to imagine The Wizard of Oz being any better (though it’s not impossible: I do wish Buddy Ebsen had been able to stay on as the Tin Man). But that doesn’t mean it would have been any worse. Just different. In that alternate universe where Shirley played Dorothy, W.C. Fields played the Wizard, Buddy Ebsen played the Scarecrow and Edna May Oliver was the Wicked Witch of the West, it’s entirely possible that people there cherish their Wizard of Oz just as much as we do ours. The most common form of the legend goes like this: In 1937, 20th Century Fox and MGM worked out a tentative star-swap. Fox would get the services of Clark Gable and Jean Harlow to star in a picture called Mrs. O’Leary’s Cow about the Chicago Fire of 1871; in return, MGM would get Shirley to play Dorothy in Oz and to co-star in another picture with Gable. But when Harlow died suddenly in June 1937 the whole deal was off; Fox made their picture, now called In Old Chicago, with Tyrone Power and Alice Faye, and MGM didn’t get Shirley. The story is interesting, with an appealing for-the-want-of-a-nail quality to it. Henry King, the man who eventually directed In Old Chicago, told it once in print (I recall reading it, but have been unable to remember or track down where), and Shirley repeats it in Child Star. But the story doesn’t really fit the facts. At the time of Harlow’s death, the screen rights to The Wizard of Oz belonged not to MGM but to Samuel Goldwyn, who had purchased them in 1933 for $40,000. Shirley gets another point wrong in Child Star when she talks about who might play “the role of fourteen-year-old Dorothy”; she actually more than doubles Dorothy’s probable age. In L. Frank Baum’s first Oz book Dorothy’s age isn’t mentioned, but W.W. Denslow’s illustrations show a girl of six or seven, and internal evidence in later Oz books suggests that that’s about right. 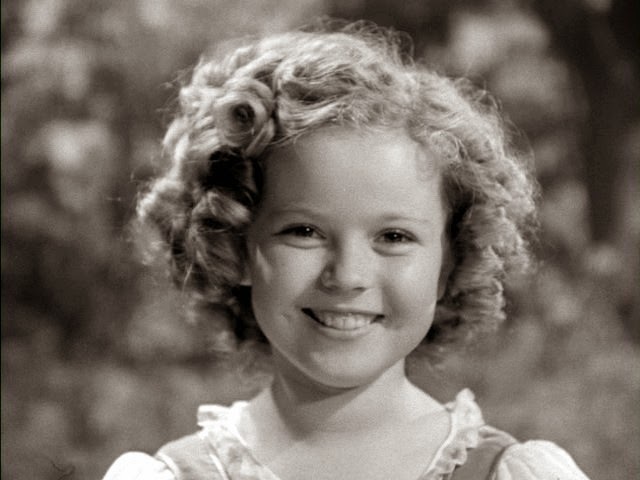 In other words, Dorothy in The [original] Wizard of Oz is almost exactly the age of Shirley Temple at the height of her career at Fox. It may well be that around that time Darryl Zanuck tried to obtain the rights as a vehicle for his biggest star (wouldn’t you? ), but aside from him there wouldn’t have been a lot of interest in the book. In any case the point was moot; Goldwyn wasn’t selling (what he though he was going to do with the property is anybody’s guess). In later years Arthur Freed, who always inflated his role in producing The Wizard of Oz, insisted he intended all along for Judy Garland to play Dorothy — even saying he would have refused to make it with anybody else. We can dismiss that. Freed was only a songwriter in 1938 with no track record as a producer (and he got no screen credit on Oz). If Louis B. Mayer could bring Gene Kelly into his office in 1951 and tell him to make Singin’ in the Rain with Debbie Reynolds (a nobody), he’d have had no problem ordering Freed to make The Wizard of Oz with Shirley Temple whether he liked it or not. And Freed would have done as he was told; he got where he was by sucking up to L.B. (to be fair, he stayed where he was by producing one great and profitable musical after another for nearly 20 years). For the picture Shirley actually did make next, the question of rights was never an issue — the story had recently drifted into the public domain. According to Variety, Heidi was chosen for Shirley by public demand, as expressed in her fan mail — although the showbiz bible may simply have been parroting a studio press release. Either way, the role was a natural for Shirley. The source was a novel by Johanna Spyri (1827-1901), first published in the author’s native Switzerland in 1880. The book was instantly popular, and promptly translated from its original German into virtually every written language on Earth. The book was — and remains — so popular, in fact, that it’s surprising to realize that Shirley’s picture in 1937 was the first attempt to make a movie out of it (there have been over a dozen since). 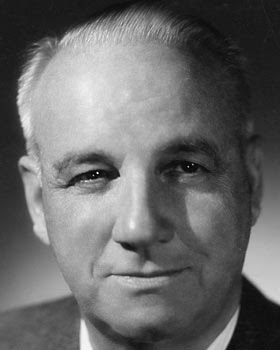 To direct Heidi, Darryl Zanuck first approached Henry King, and he was an excellent choice. King’s directing career began in 1915 (and would stretch on to 1962), and he was one of that select group of directors who mastered moviemaking in the silent era, then adapted easily to the changing times when sound came in. By 1937, at Fox, he had already directed, among others, the first State Fair (’33) with Will Rogers and Janet Gaynor; Ramona (’36), Fox’s first Technicolor picture, from the Helen Hunt Jackson novel of old California; and Lloyds of London (also ’36), which made a star of Tyrone Power (who would work with King ten more times). Still to come were some of 20th Century Fox’s most important and successful pictures: Alexander’s Ragtime Band (’38), Jesse James (’39), The Song of Bernadette (’43), Wilson (’44), Twelve O’Clock High (’49), The Gunfighter (’50). King was the only director under contract to Fox who even approached the stature of John Ford (though King was a rather distant second at that), and if he had worked with Shirley it might have carried her farther along that fork in the road her career had taken with Wee Willie Winkie. As that anecdote suggests, Dwan throughout his prolific career was more stage manager than creative artist, and that was the attitude he brought to Heidi. 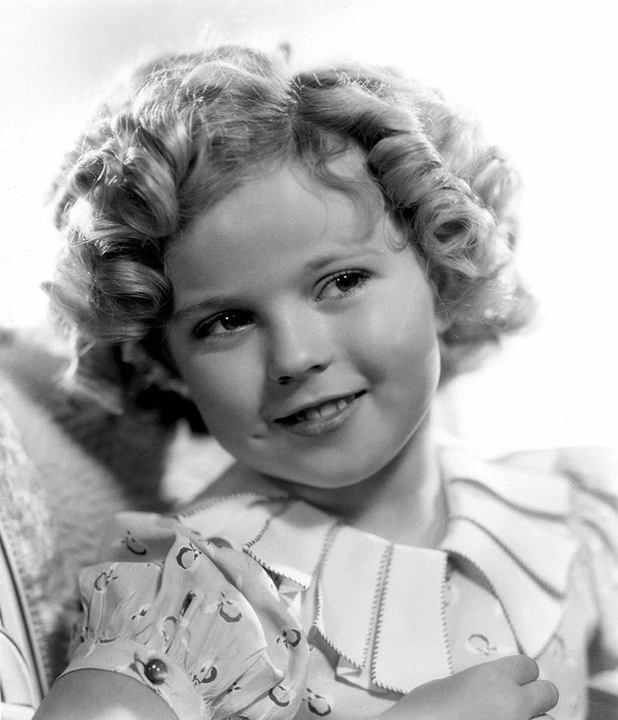 In Child Star Shirley quotes him in a later interview as saying, “I liked to avoid children, especially those that were ‘over.’ She had hit her peak and was sliding fast when I started working with her.” Shirley doesn’t say when or to whom Dwan said this, but he was clearly speaking from hindsight; in 1937 few people thought Shirley Temple was “over”. Now, we can see that Shirley’s career at Fox had indeed peaked — probably with Captain January, Poor Little Rich Girl, Stowaway and Wee Willie Winkie — but she had been number one at the box office in 1935 and 1936, and would continue to be in 1937 and 1938. Dwan overcame his hesitation at working with Shirley (she won him over, of course; she won everybody over — except perhaps Alice Faye), and he and Shirley went on to make two more pictures together. Shirley was by no means “sliding fast” when she made Heidi — but her slide started soon thereafter, and the pictures she made with Dwan were a part of it. Small wonder that years later he preferred to believe that she was already fading before he came along. 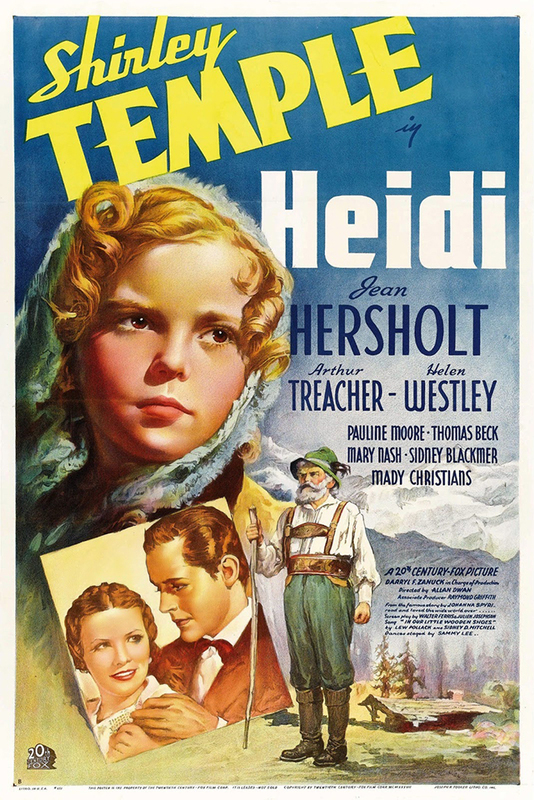 The story of Heidi hardly needs synopsizing; nearly everybody knows it — or thinks they do. 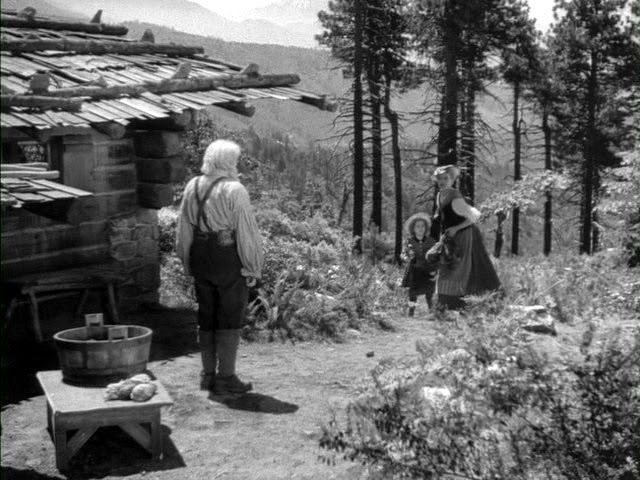 A sweet little orphan girl is dumped by an unfeeling aunt with her grandfather, a bitter, reclusive hermit and a stranger to her. Then, just as Heidi is beginning to thaw the heart of the old man, the aunt returns and kidnaps Heidi away to be sold to a wealthy Frankfurt family as a companion for the crippled daughter of the house. Screenwriters Walter Ferris and Julien Josephson grappled with the narrative fermata that sets in on page 240 of Johanna Spyri’s book, choosing to solve the problem in a way that was utilitarian but not really felicitous. In the book Heidi makes friends with the crippled Klara — in fact, with everyone in the household except Fraulein Rottenmaier, the starchy, humorless old maid housekeeper. But Heidi becomes so homesick that Klara’s doctor insists she be sent home to her grandfather. Then come those 140 pages of Heidi romping through the Alps with her friend Peter, the goatherd, and mending the hard feelings between her grandfather and the villagers below. All this time Heidi keeps in touch with Klara, who finally comes to visit when the doctor agrees her frail health is strong enough. In the clean Alpine air, and with the encouragement of Heidi and her grandfather, Klara’s health is restored and she’s able to leave her wheelchair and walk again. Ferris and Josephson replaced all this pastoral cavorting with melodrama. Heidi doesn’t go home to her grandfather until the very end; before that the old man (Jean Hersholt) walks the 100 miles to Frankfurt in search of her, then stalks the city streets calling her name, sometimes missing her my mere seconds. Meanwhile, Fraulein Rottenmaier (Mary Nash) is upgraded (or downgraded) from a mere narrow-minded, stiff-necked stick-in-the-mud to a full-fledged villainess; she plots to keep Klara (Marcia Mae Jones) crippled and dependent in the hope that the girl’s father Herr Sesemann (Sidney Blackmer) will be moved to marry his “indispensable” housekeeper. When Heidi unwittingly thwarts Fraulein R. by teaching Klara to walk, the fraulein retaliates by — I am not making this up — trying to sell Heidi to a band of gypsies. Only the intervention of a cool-headed police captain clears the way for a happy ending back on Heidi’s mountain. This lasts precisely 19 minutes and 37 seconds. They are made out of wood. Don’t you think they look good? (The song is “In Our Little Wooden Shoes” by Lew Pollack and Sidney D. Mitchell, uncredited.) Then Shirley leads her companions, all of them dressed in adorable Hans Brinker costumes (the boys look like they all stepped off a can of house paint), in an energetic clog dance (staged by Sammy Lee, also uncredited), with Shirley soaring over their heads to land in a treetop, then turning to sail back to earth — or rather, to the stage floor — again. 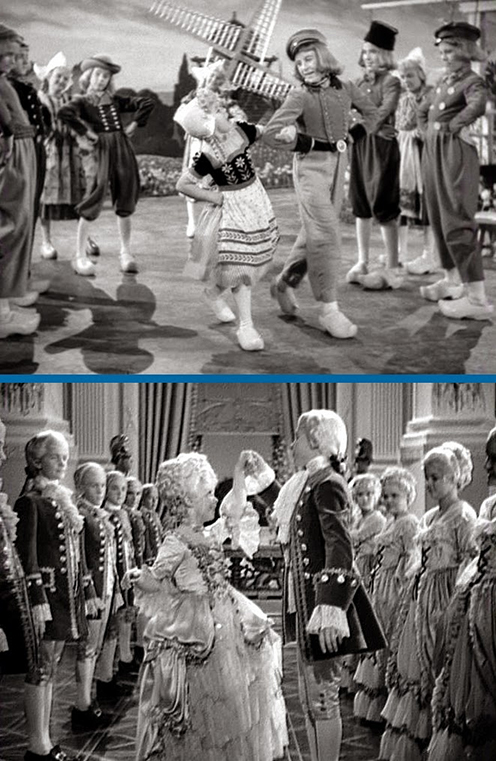 Then, apropos of absolutely nothing whatsoever, the scene dissolves to an elegant marbled hall, with Shirley dolled up like a miniature Marie Antoinette, leading (presumably) the same troupe of children, now dressed like lords and ladies of the French court, in a genteel minuet to the same tune. Then the number segues back to that stagebound Holland and its two-dimensional windmills, and finally back again to Switzerland as the grandfather tucks the sleeping Heidi into her little bed. Shirley tells us that the number was inserted in the picture halfway through shooting. Whose bright idea was it? I blame Darryl Zanuck; nothing happened at his studio or went into his pictures that he didn’t know about and approve. What ever happened to “We don’t want to depend on any of her tricks” or “She should not be doing things because she is Shirley Temple, but because the situations — sound and believable — call for them“? I can only think — and this is pure speculation on my part — that Zanuck’s edicts in that story conference on Wee Willie Winkie were said simply to placate John Ford, as if Ford had said, “All right, Darryl, I’ll direct your Shirley Temple picture, but don’t try to saddle me with any of those cute little song-and-dance scenes; I won’t have it.” Maybe if Henry King had agreed to direct Heidi, those edicts would have stood. King might well have insisted, but not a director like Dwan. At the time, Shirley enjoyed the number, enjoyed wearing those Dutch braids and bangs, enjoyed being flown on that invisible wire. In retrospect, writing in Child Star, she saw it as the turning point in her career. She called the “Wooden Shoes” number “a traditional Temple musical filler”, adding that “it marked the collapse of any studio resolve to build on the purely dramatic momentum first evident in Wee Willie Winkie.” With the same hindsight we can see that Shirley was right. But looking back, we can see the handwriting on the wall. For me, seeing Heidi again for the first time in nearly 60 years was an eye-opening shock. I had remembered it as one of Shirley’s best-loved pictures. In fact, it always perplexed me that the 1952 Swiss version, which I saw about the same time, stayed fresher in my memory over the decades. Seeing Shirley’s again, I’m no longer perplexed. Heidi is no doubt one of her best-loved pictures, but it’s not one of her best. Despite those very good early scenes, and some later ones like the scene where the grandfather accompanies Heidi to the church that he hasn’t visited in years (straight out of Frau Spyri’s novel), the picture never recovers from the miscalculation of “In Our Little Wooden Shoes”; it’s one of the head-scratching what-on-Earth-were-they-thinking moments of 1930s Hollywood. What they were thinking, I suspect — or more to the point, what Darryl Zanuck was thinking — was that his dictum about writing the story as if it were a Little Women or David Copperfield, about writing for Shirley as an actress and not depending on any of her tricks, was no longer operative. Henceforth, as far as 20th Century Fox was concerned, Shirley’s tricks would be her stock in trade. The studio was no longer interested in Shirley becoming an actress; instead, they would keep her a baby taking a bow for as long as they could get away with it. I'm a self-professed Shirley super fan and have been for the better part of 40 years. I even met her in 1988 on her book tour. Your posts in the Revisited series were some of the most honest and thorough and accurate accountings of Shirley I've ever read – and I've read most! Thank you for an outstanding tribute to an outstanding star. As a self-proclaimed Shirley super fan for the better part of 40 years, I would like to thank you for this tribute. Your Shirley Temple Revisited posts are among the most accurate, thorough and revealing writings I've ever read – and I've read most of them! I plan on rereading them all again, with pleasure! Welcome, Melissa! I couldn't decide which of your comments I found most gratifying, so I published them both! Thanks for dropping by, and for your kind comments on my long series on Shirley's career; I put a lot of time, work and love into it, so much appreciated!